US Ambassador Nikki Haley accuses Russia of trying to protect Syrian President Bashar Assad. UNITED NATIONS — The United States and Russia are again clashing over a probe to determine responsibility for chemical weapons attacks in Syria, with Washington circulating a new draft UN resolution and Moscow moving toward a vote on its own proposal. The United States and Russia have been lashing out at each other for months over the issue of accountability for chemical attacks in Syria, which is a close ally of Moscow. This divide comes amid reports of suspected chemical attacks in the embattled rebel-held Damascus suburbs of eastern Ghouta. French President Emmanuel Macron reiterated Friday that the use of lethal chemical weapons, if proven, would lead to a strong response. Russia vetoed a Western-backed resolution in November that would have extended the mandate of the Joint Investigative Mechanism, or JIM, which was charged with determining responsibility for chemical attacks, dooming its operation and making accountability exceedingly difficult. The JIM consistes of experts from the UN and the Organization for the Prohibition of Chemical Weapons. It concluded that the Syrian government used chlorine gas in at least two attacks in 2014 and 2015 and used the nerve agent sarin in an aerial attack on Khan Sheikhoun last April 4 that killed about 100 people and affected about 200 others. The team also accused the Islamic State of using mustard gas in 2015 and again in September 2016 in Um Hosh in Aleppo. Russia’s UN Ambassador Vassily Nebenzia accepted the accusation against the IS militants but rejected the experts’ findings on the Syria government as unproven and demanded major changes in the way the JIM operates. 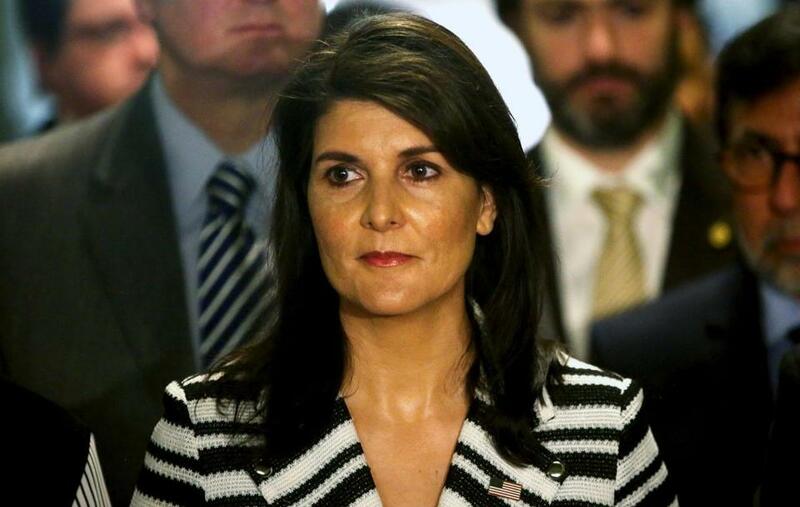 US Ambassador Nikki Haley accused Russia of trying to protect Syrian President Bashar Assad. Nebenzia accused the JIM of accusing Syria of using chemical weapons without identifying any perpetrators. Nebenzia circulated a draft resolution in January that would replace the JIM, but Western powers expressed serious reservations, saying it ignores the JIM’s finding and would give the Syrian government control over investigations and require investigators to visit the site of all chemical attacks. The United States circulated its proposal to replace the JIM this week, incorporating some Russian proposals. A Security Council diplomat, speaking on condition of anonymity because consultations were private, said the United States invited council members to attend a meeting at the US Mission on Thursday to discuss the draft resolution but Russia didn’t participate. Council diplomats said Russia put its draft resolution ‘‘in blue’’ late Thursday, which means it can be put to a vote when they ask.